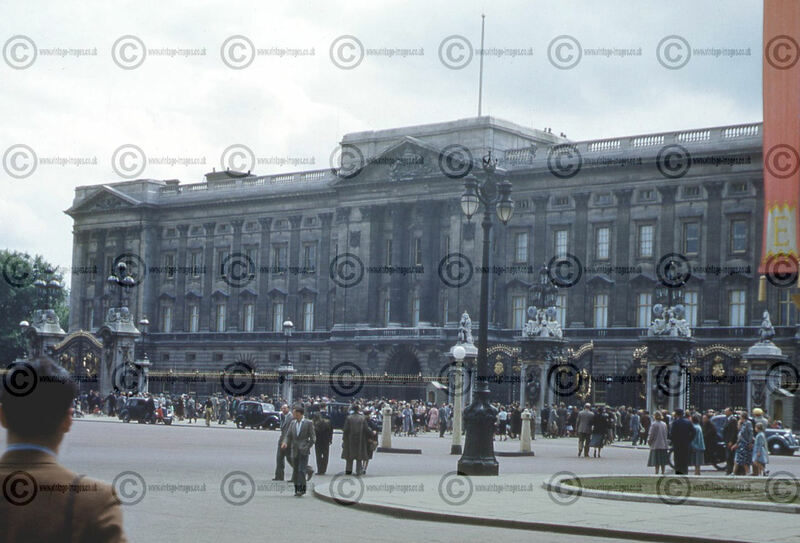 The Past in Colour: The front of the Palace......for real, this time! Round the front of the Palace (not the theatre this time!) and we are in what may be more familiar territory, but four years earlier than the previous post for this is 1953. Buckingham Palace is seen in all its smoke begrimed glory - the stone having been cleaned in recent years. This is the official residence of the British monarch, but not that of the Court, which is still officially resident at St James Palace, and a coronation is in the offing. George VI having died the previous February, Elizabeth II is now on the throne and her coronation is in a few days, and despite it being June, it will take place in the pouring rain. London's streets are bedecked in decorations, but these are surprisingly muted here with only some red banners bearing the letter E to be seen on the right hand side of the image. The few cars in shot appear to be pre-war and the fashions are muted, Britain was in a period of austerity and the browns, greys and pastel colours of the clothes are typical of the early 1950s. The demographics of the colour palette would not change until the mid to late 1950s when the brighter colours we are familiar with today would start to appear.